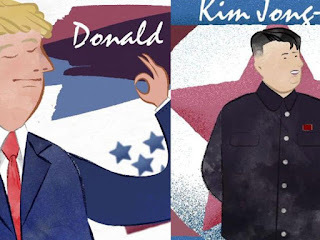 Kim and Trump have already said that they will meet to try to find a solution to the differences between their governments at the dialogue table, differences that makes everyone to talk hot-peppered since the highest world powers have said everything and have come to what economic and legal resources exist to show their position in the conflict. These powerful nations’ disquisition lets see what their point of view and crest more pressure on each other. The curious thing is that no matters in what scenario, the United States, the Western-capitalist nation that, in fact, has faced those of the East, China (Communist) and Russia (those who invented Communism) still remains the main issues. However, despite Donald Trump believes that the United States will return victorious in each of the fronts in which he has launched his crusade, the majority of Americans consider that these tensions will be increased mainly by the growth of economic restrictions and measures they have imposed on China and Russia, powers that paid with the same currency to Washington, could seriously affect US economy. Recently, interim Secretary of State John Sullivan proved that Trump's American First policy spares no words to refer to the enemies of democracy. He stated to the press that the United States will set an example and promote good governance and respect for the law. Through Sullivan Trump even accused China, Iran, Russia and North Korea of ​​being "destabilizing forces" for repressing their own citizens and perpetrating aggressions outside their borders. Isn’t it ironic? All these diplomatic and political actions have created the discontent and uncertainty of the American society in general. Recently, the NORC Center for Public Affairs Research revealed that 56% of them believe that relations with Russia will worsen, and only 13% believe that they will improve. Meanwhile, 40% of the Republicans think that they will get worse, 20% think they will improve and the rest consider they will remain the same. For the majority of the inhabitants of the first world power, President Donald Trump is causing the country too many problems, to the detriment, precisely, of the economy. The tensions’ increase happened due to the fact that several of the nations Trump has attacked are allies or protected by Russia, say China and Iran. In the case of Syria, for example, the Russians have reiterated their support for the regime of Al-Assad, a fact that has outraged the Yankee leader, and that has been reflected through the imposition of sanctions and restrictions on the Eurasian country. Despite that, Trump sometimes seems to ignore that Russia is a country with abundant natural resources and strong business ties with investors from the United States. On the other hand, in the same conflict is Iran that emerges as a power and has the support of Russia. In the case of North Korea, the game gets more difficult. Besides Russia, China is another "friend" of Kim-Jon. The Chinese are not happy with the United States, which has imposed tariffs on its products. The Asian giant, in addition to trying to maintain its geopolitical hegemony in the area, is also a nation that has tightened US’s neck. It is not a secret for the US Treasury Department that the Chinese have enough bonds and in addition, numerous investments in American companies. Besides, they have been gaining ground in the Latin American continent, a market that the United States is trying to regain, but that the Chinese have little by little been stealing from them. On this regard, 48% of Americans consider that relations will worsen next year and only 17% believe quite the opposite. Donald Trump, unquestionably, is stirring up the bees of the honeycomb; the fact could end the level of life of several Americans and has brought uncertainty and discontent.